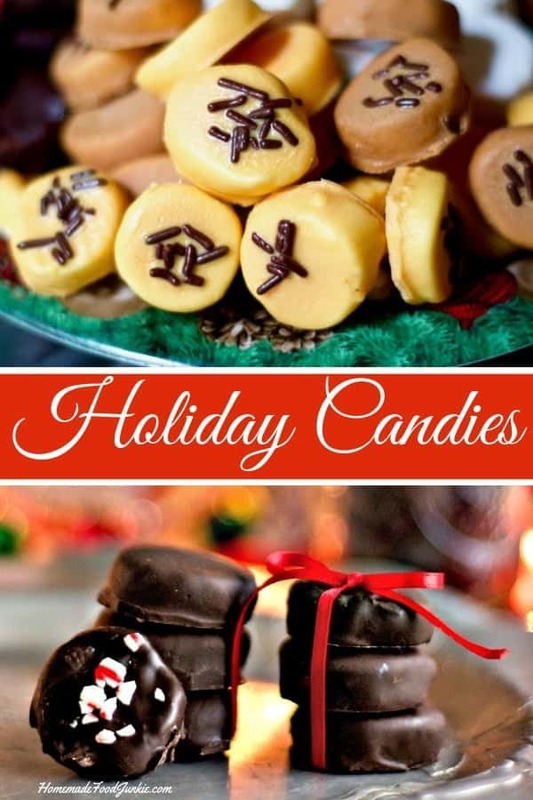 These delicious Holiday candies are super cute and yummy! They are simple to decorate and make appropriate for any holiday you are celebrating this season! I have a Pinterest problem. 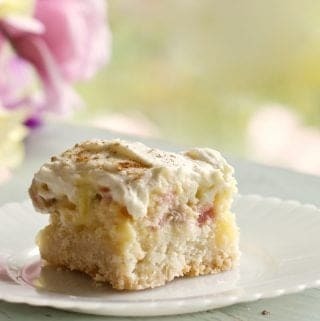 The goodies on the Pinterest boards! I think to myself “This can’t be that hard, it looks so simple! I can definitely do that!” well I did it again with these candies. If you are a super awesome creative person that loves making cool things than these candies are for you! I’m really not terribly creative so these took me a long time just to decide how to color and decorate them. Also if you use candy melts often and know how to work with they are VERY easy. BUT, if you don’t know the tricks they can reek havock with your (supposed to be) simple projects. Like dipping homemade candy. Read on for my ‘learned from experience’ tips! Holiday Candies Recipe made with an almond flavored candy dough and Peanut butter flavored candy melts. Tasted great! I made this batch for Thanksgiving. But I can’t keep the family out of them. Once you get the basics of dipping the candies down this is a VERY easy project well suited to older kids that need creative gift ideas for friends and teachers. 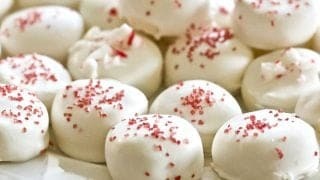 One of the things that I really love about these holiday candies is that you can make them taste and look however you want. 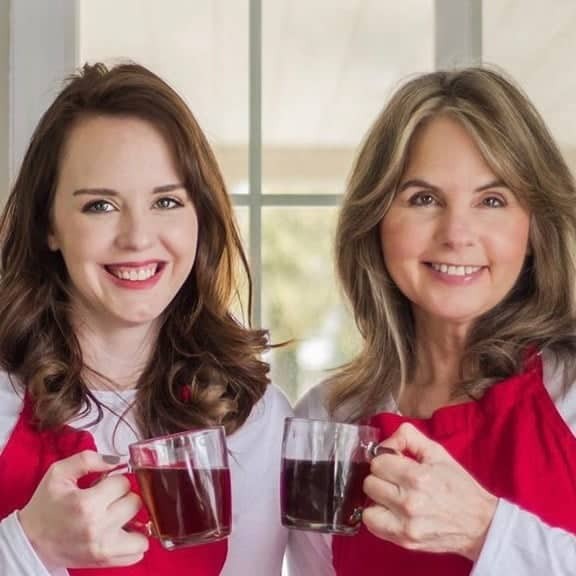 We love them in mint and almond flavorings for Christmas. It’s really easy to make them themed to go with any party or Holiday. Valentines Day, Thanksgiving, Birthdays, Christmas…pretty much any time of year you can give these as a gift or add them to a party tray. Any color, toppings and flavors. The mind boggles! I made 3 different flavor batches the first time I made these. Cherry almond, orange, and peppermint. (I made them in Thanksgiving colors too and arranged them in a turkey tail pattern. Very cute!) I wanted my Thanksgiving themed candies to have flavors other than peppermint so I threw in the orange and the cherry almond. I colored the candy dough with my Wilton gel colors and half dipped the candies in white chocolate. It worked. But the candy was a bit sticky. 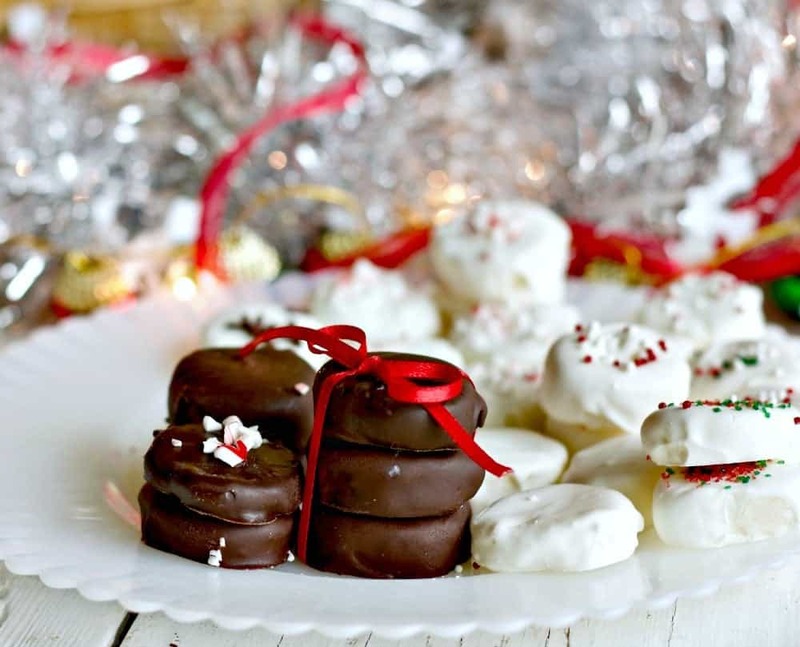 Holiday Candies with white chocolate and red sprinkles. The hard coating makes these candies very easy to pick up and eat without a mess. Such good party food! 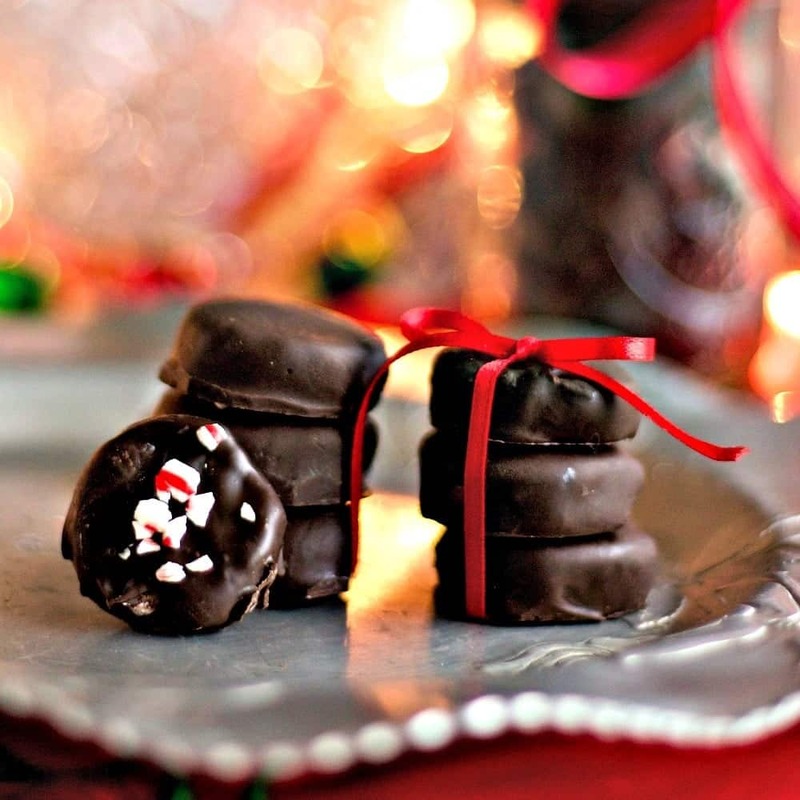 The dark chocolate Christmas candies are totally peppermint flavored. I also dipped my candies in white chocolate (I used the white chocolate melting wafers they are awesome!) 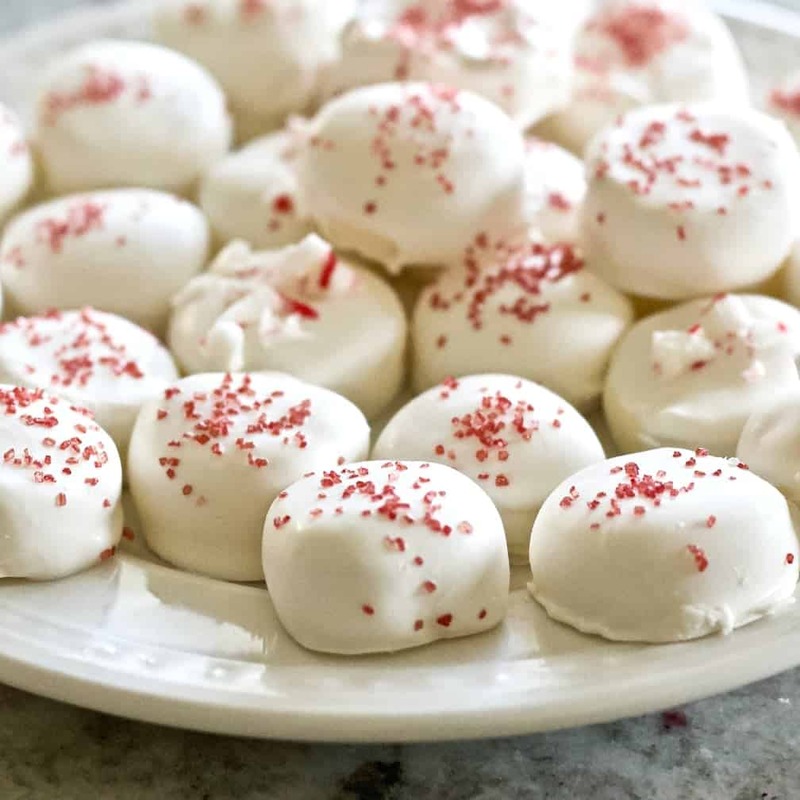 The combination of the white chocolate with the peppermint creates a fantastic peppermint patty type feel to these delicious candies. It tastes like tiny bites of Christmas. Do NOT cool in a dough ball. Instead roll the dough into a log about an inch to an inch and a half in diameter. ALSO: I half dipped these candies the first time I made them. They were cute BUT. The un-dipped half of the candy stayed somewhat sticky. For this recipe we recommend you fully dip the candies to make them more manageable. FOLLOW THE PACKAGE DIRECTIONS FOR EACH COLOR. THEY DIFFER! Put your microwave on half power and heat the melts for 30 seconds, stir the melts and repeat until the candy melts, melt! IF your candy melts are melted but gloppy and thick. Add coconut oil (or any vegetable oil) in small amounts as you reheat the melts and stir it up. Continue to thin with coconut oil (or any vegetable oil) until you get the consistency you desire. Do NOT overdo the oil though or it will take a long time to set. If you overheat your candy melts- let them cool down to room temperature, add some oil and slowly and gently reheat. As you stir in the oil, the candy melts should thin and smooth so you can dip the candies with good results. Roll it into a long roll about 1 to 11/2 inches in diameter. Wrap the candy in saran wrap and chill about 30 minutes. Set up your toppings and get the candy melts ready to dip. Unwrap your wrapped, cooled candy roll. Roll it around until it makes a perfect roll. Cut the candies from the end of the cooled dough roll. 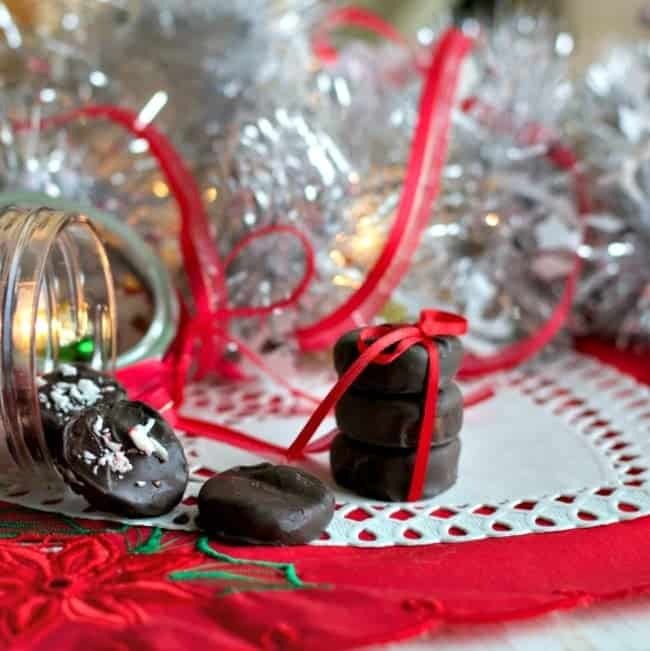 Holiday Candies Recipe are easy to make and theme to your party or giftee needs. Chill the rolled and wrapped candy dough. 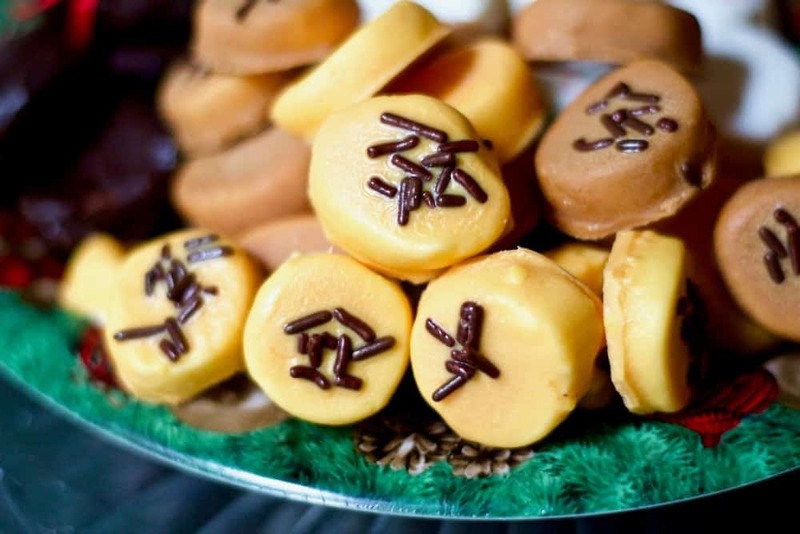 Cut into small wafers. Dip and sprinkle the top with whatever you desire or leave them plain. Sets up in less than an hour. Pretty easy homemade gift or party food idea! 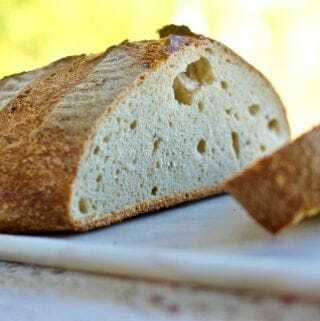 Shape any rough points off until they are dough circles. Dip the candy dough into the candy melts with a fork, make sure it’s coated all over. 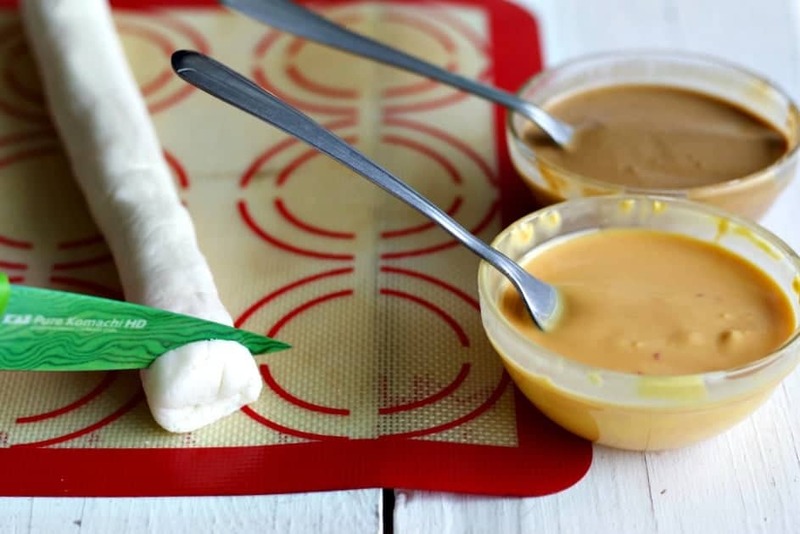 Have your dipping and topping stations set up before you cut the chilled dough. Place the candy onto your cooling station and leave them alone OR top them now with your choice of crushed candies or sprinkles. 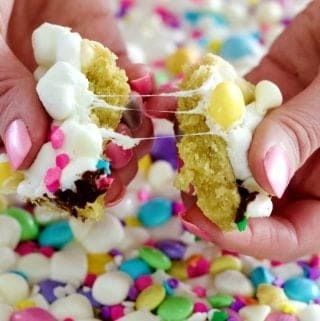 dip into the candy melts with a fork and place them on parchment or silpat mats to set up. Top with sprinkles, crushed mint or nuts as desired before the candy top gets hard. The candies will cool and set within an hour, depending on much oil is in the candy melts. Once the candy is set up hard trim off the excess candymelt on the tray(see above) with a sharp knife. In a deep mixing bowl combine butter, cream and powdered sugar. Add the extract of your choice and taste it to make sure you like the flavor intensity. Add more if desired. With an electric mixer on low speed mix it all up until it forms a dough. Continue mixing at high speed until the dough is manageable. 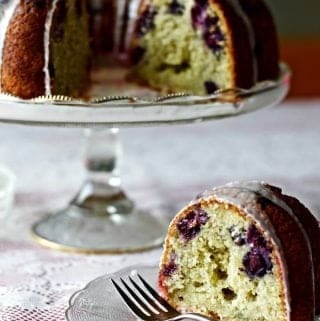 Add extra powdered sugar a little at a time until the dough is stiff and no longer sticky. Form the dough into a long skinny roll the circumference should be as big as your preference for your candies about 1 to 1 1/2 inch round should work well. Tightly roll into plastic wrap and twist the ends. Refrigerate about 30 minutes until dough is easy to cut. 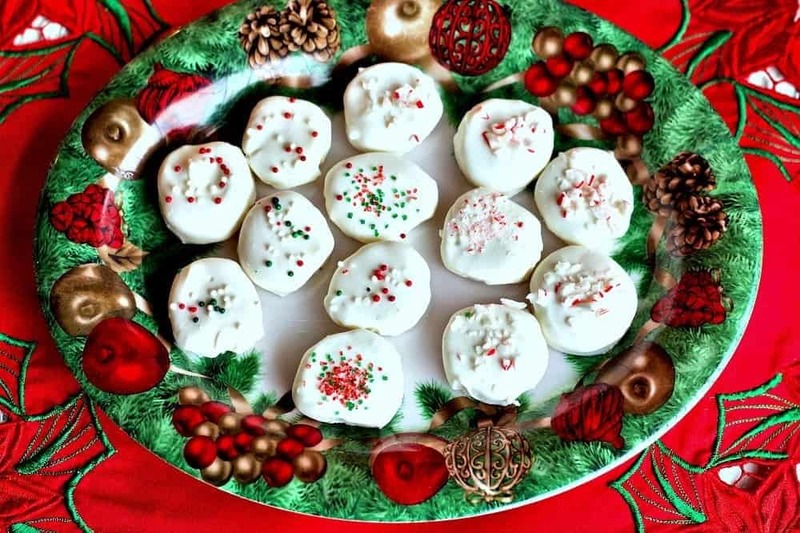 Spread powdered sugar down on a cutting board and roll out the dough with a rolling pin that is also lightly coated in powdered sugar and cut into shapes. OR just cut into small circles off the end to form small round candies. 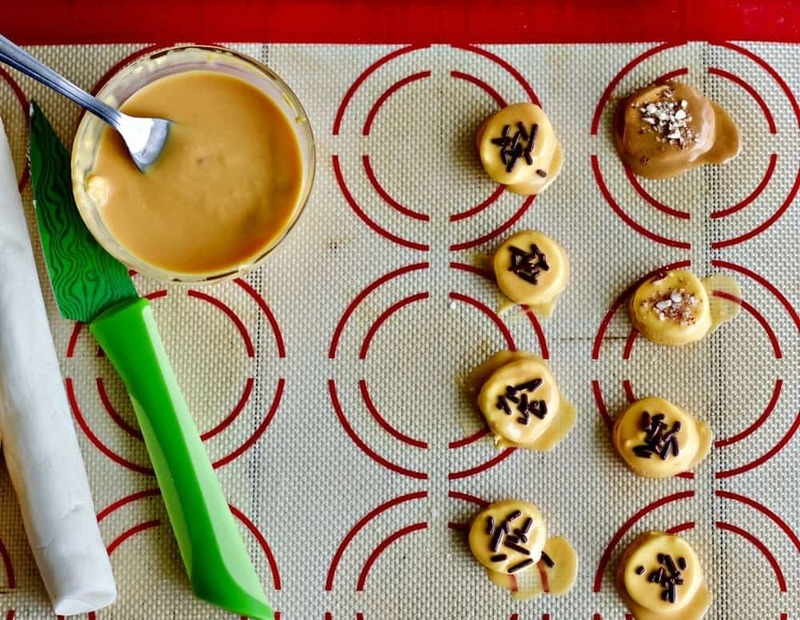 This is the easiest method for dipped candies. If you are having a hard time with the dough sticking, pop it in the fridge to cool for 5-10 minutes. Cut shapes out of your choice and place them on a parchment paper lined cookie sheet. Dip them in Candy melts of your choice and decorate them however you would like. They will set up hard in about an hour. Trim off excess candy melt with a sharp knife. 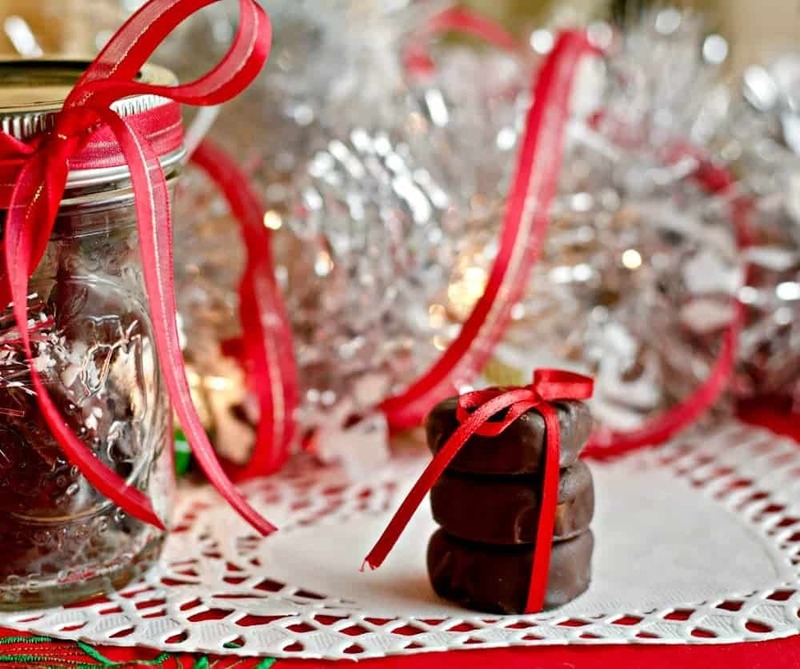 Have fun with these holiday candies! They are easy to decorate and they will make perfect additions to any party!! Here is a pic of the original holiday candies I made. They were cute but somewhat sticky half dipped.